Databases fall into several different categories. The earliest databases, up through the mid-1980’s, were so-called CODASYL databases. These organized data into records and related occurrences of different record types to one another using hashes to form a network. Although generally efficient CODASYL-style databases, like IDMS from Cullinet Software and IMS from IBM the context and navigation required that the application bet exposed to the physical relationship between records. When new requirements surfaced for applications to combine data in new ways the database administrator was required to create the new physical relationship to support the requirement, all before application development could begin. This could be as simple as merely defining the new relationship, but it always required careful planning and often resulted in extensive database reorganization. Exposing this level of physical database structure onto the applications had the impact of increasing their complexity. In addition, the embedded dependency of the physical database schema into the application meant that database changes required extensive application modification and testing. For example, a common relationship is that of a parent and child where a parent record occurrence owns one or more occurrences of child records. This type of relationship is used to maintain Savings Account records for an individual and connect them with individual Transaction records representing activity against it. In the early 1980’s a new type of database based on the Structured Query Language (SQL) began to take hold. The main advantage of a SQL database had over a CODASYL database is that manipulating data was simpler since data in a SQL database is organized relationally rather than physically. Application logic was based on the concept that data would be returned in a tabular format consisting of rows and columns and data from different tables could be aggregated based on the shared data values in tables rather than on physical relationships. This meant that application programs became simpler to write and maintain. The SQL example above demonstrates the power of SQL. Rather than requiring navigational logic in the application to traverse the database, data is retrieved based on a shared key value between the Account and Transaction. Namely, the account number. The SELECT directive results in the database management system returning a the exact set of data required by the program. With the rise of the Internet in the late 1990’s applications shifted from dealing strictly with highly structured data, like accounts and transactions, to also dealing with unstructured data like plain text. Just as important was the fact that applications needed to be able to quickly adapt to new requirements and to scale to support transactional volumes which far exceeded what was seen in older mainframe and distributed computing environments. NoSQL database were developed to provide an environment that supported change without requiring radical reengineering of the underlying data model, high volumes of data, and an architecture that was easy to scale. MongoDB is a *document-based* database management system which leverages a JSON-style storage format known as binary JSON, or BSON, to achieve high throughput. BSON makes it easy for applications to extract and manipulate data, as well as allowing properties to be efficiently indexed, mapped, and nested in support of complex query operations and expressions. In addition to the “phone number” the following connection parameters may also be specified. The host name and database name are required, but the remaining connection parameters are optional. For simplicity the examples that follow use only the host and database names. However, in a production environment you will always want to secure database access by requiring that users and applications authenticate by specifying an authorized user id and password. Since database access is typically distributed across more than one source file in an application a best practice is to isolate the host and database names into a config.js file that is shared across all application components. The advantage of this is that altering either or both of these only requires an update to the config.js file rather than to each application source file that requires a connection. that subsequent database requests will be issued through. The first such request is mongoClient.connect(mongoUri) which creates the connection and returns a reference to the client instance. Once a connection has been established the application is ready to access and manipulate documents in the database. The first step in this process is to define the document collection within the database. This is conceptually similar to a table in a relational database (RDBMS). Unlike tables in an RDBMS whose rows all have a the same format a collection can contain different types of documents, each having a different format. which defines a reference to the collection accounts. Once the collection is created it can be used to invoke MongoDB function calls to access documents in the database. For example, collection.count() returns the number of documents in the collection. Promises help to eliminating the “nest”, which serves to simplify the code making it easier to ready and thus easier to maintain. The way this works is the logic in the .then() is executed only when the associated Promise has been resolved. Conversely, the .catch()is executed only if the Promise was rejected. In other words, if an error was detected. After when the application has completed its goal and no more data is to be retrieved from the MongoDB it’s a good practice to gracefully terminate the connection to the MongoDB instance. This is accomplished by closing the connection. In the example above this is done by calling the accountsDb.close() function to stop the connection and free up any resources devoted to it. You may have noticed that in the first .then(db) function the value of db was saved to a variable called accountDb. This was done in anticipation of it being needed later in the application logic to close the connection. This was necessary since the scope of db is limited to that first .then(db) function. One additional consideration is there are cases where you may not want to close the connection. Since opening and closing connections are relatively expensive high volume applications might want to use connection pooling to reuse connections rather than continually opening and closing new ones. MongooseJS is an Object Document Mapper (ODM) that makes using MongoDB easier by translating documents in a MongoDB database to objects in the program. Besides MongooseJS there are several other ODM’s that have been developed for MongoDB including Doctrine, MongoLink , and Mandango. MongooseJS provides an abstraction layer on top of MongoDB that eliminates the need to use named collections. Models in Mongoose perform the bulk of the work of establishing up default values for document properties and validating data. Functions may be attached to Models in MongooseJS. This allows for seamless incorporation of new functionality. 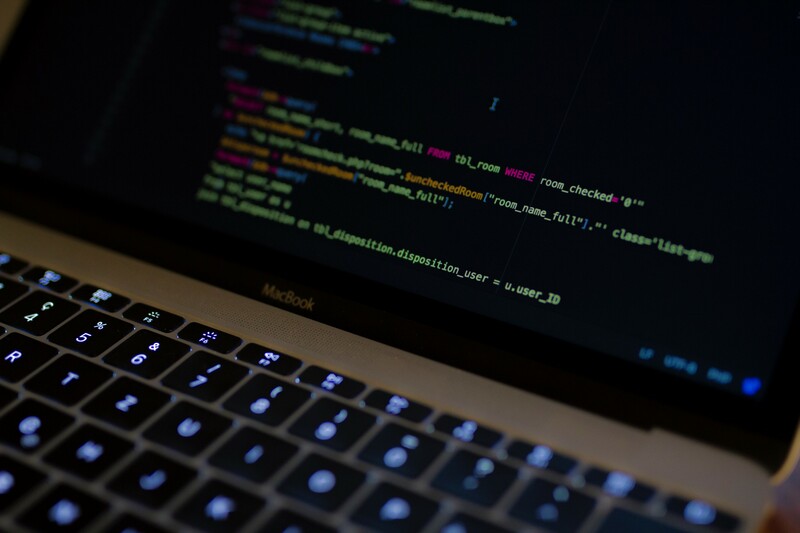 Queries use function chaining rather than embedded mnemonics which result in code that is more flexible and readable, therefore more maintainable as well. The net result of these is the simplification of database access from applications. The main disadvantage of Mongoose is that abstraction comes at the cost of performance compared to that of native MongoDB. Mongoose uses schemas to model the data an application wishes to store and manipulate in MongoDb. This includes features such as type casting, validation, query building, and more. Data type (e.g. String, Number, etc.). Whether or not it is required or optional. Is it’s value unique, meaning that the database is allowed to contain only one document with that value in that property. A model is generated from the schema and defines a document the application will operating on. More precisely, a model is a class that defines a document with the properties and behaviors as declared in our schema. All database operations performed on a document using Mongoose must reference a model. How Does Mongoose Code Differ from MongoDB? The first difference between a Mongoose and a native-MongoDB application is that a module containing the schema and model must be created in the models directory. The schema definition is quite interesting and useful since it can specify attributes of each property including data type, whether it is required or optional on an insert or update, and whether its value is unique or not. A best practice is for this file to have the same name as the model. The first character of this file is in uppercase since a model is a class built from the schema. Like any class it’s first character should therefore be an uppercase letter. For our example the following file, Account.js, contains the Mongoose schema and model definitions. The second major difference, although arguably relative to each developer, is that queries are easier to construct and read in Mongoose than in native-MongoDb. MongoDB queries consist of structured BSON specifying document property names, operators, and values, which together specify how documents are to be filtered. An example of a MongoDB query that selects documents where the owner_fname is equal (“$eq”) to a value of “Roger” is shown below. Compare this to Mongoose which uses the combination of functions and function chaining, rather than operators to filter documents. 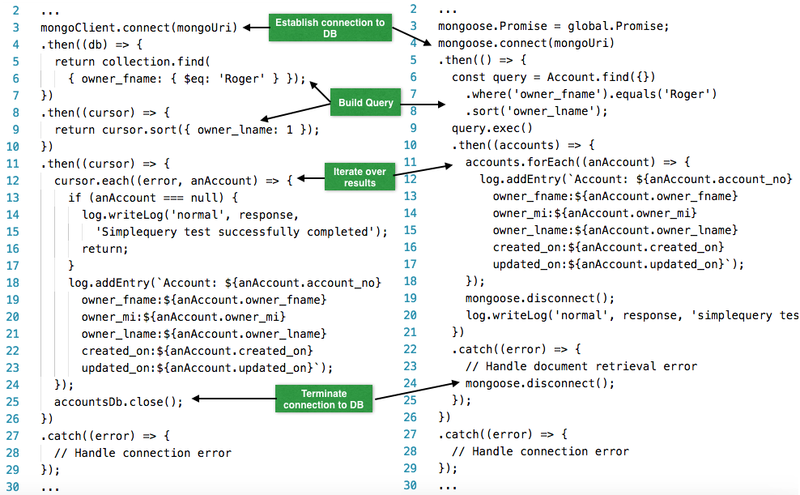 Although longer than its MongoDB equivalent the Mongoose version of the query is clearer to the reader and can end up being shorter as queries become more complex and more properties are required in the BSON. A line-by-line comparison of the code for a native-MongoDB program and its Mongoose equivalent is shown below. All of the sample code used in this article can be found on GitHub. I hope this information useful and I also look forward to any questions and comments you might have. Have a good day and go do great things!